Riding in a group is far easier than riding on your own as you can maintain a higher average speed in an efficient group, and it is also part of the fun of taking part in sportives. Riding in a large group can appear daunting at first but anyone can learn how to be a safe, smooth rider and benefit from the faster pace of riding in a bunch. Firstly it helps to learn some of the dos and don’ts of group etiquette. Once you know these things, what looks erratic and risky at the outset becomes clear and easy to follow. The language of the peloton is universal. This means that even if you find yourself in a multi-cultural group of riders from all over the world with no single common language, you’ll still be able to communicate and enjoy riding together. Being considerate to the riders around you and thinking about how your actions may affect them is essential. Be observant of what is happening around you and communicate any potential problems to riders near you. In a bunch all riders are responsible for each other’s safety. The only way a group can safely ride together is if the riders at the front and back act as the ears and eyes of the whole group and the messages are passed along the lines. When you see a pothole, point it out before you go round it so the rider behind you knows what you are about to do and can avoid the hole. If you need to move out around an obstacle or parked car indicate with your arm behind your back which direction you are moving in, before you change your line. If you are stopping or slowing, indicate with your hand down at your side, palm toward the rider behind you. A shout of ‘car up’ (approaching from behind), or ‘car down’ (approaching from the front) warns other riders about traffic. If necessary you may need to warn people to ‘single out’ to give the vehicle room to over take. Often group rides can be really noisy, with people calling out every pothole, obstacle or vehicle. This can make people feel nervous and jumpy. Stick with hand signals as much as possible and only shout a warning if it is necessary — shout too much and you become the boy who cried wolf. Keeping a relaxed posture on the bike is important. It’s surprising how much energy you can waste when you’re tensing up your body and panicking about keeping up. Relaxing your shoulders and holding a smooth, straight line will help you to feel confident and avoid expending unnecessary energy shifting around in the saddle. When cornering with other riders around you try to maintain a smooth and predictable line and avoid heavy braking. Groups often adopt a tighter formation on hills, so if you stand up in the saddle, change up a gear and apply extra pressure on the pedals to avoid momentarily slowing and hitting the front wheel of the rider behind. Positioning is everything when you’re riding in a bunch or on a wheel. Free speed is up for grabs if you find that magic sweet spot where you’re protected from the wind. This is fairly close to the rider in front — 30cm or less — and is where trust and communication come in. You need to know the rider in front will be smooth and avoid any sudden braking or swerving. One important rule is never to overlap your front wheel with the rear wheel of the rider ahead. Touching wheels is a common cause of crashes. Get as close as you can to benefit from the shelter but don’t overlap wheels. If you’re worried about being dropped from the pack then the aim of the game is to hide where possible and expend as little energy as possible. This means avoiding sitting out in the wind, and tucking in behind a rider you trust. A larger rider will offer more shelter, for obvious reasons, but a smooth rider can make it feel a lot easier to keep up. What’s more, don’t allow yourself to drift right to the back as this is where gaps in the group are amplified and you will have to work even harder to get back on after tight corners or changes in pace. Try and stay in the front third of the group, near but not on the front. Staying in this position takes focus; it’s easy to drift to the back without realising. If you’re worried about being dropped on the hills, try to give yourself some ‘slipping room’ if you want to stay with the group: if you start the hill near the front of your group, then you can ride it slower than everyone else and hopefully still be in the group (albeit near or at the back) when you reach the top. In our sister publication – Cycling Fitness – we asked readers to send in their problems with riding in a group, and below we offer solutions and advice on each. Problem: Riding through give ways and red lights with an “all clear” — as if that makes it legal — or not yielding to pedestrians. Solution: When in a chaingang situation (constant through-and-off or rotation) it’s all too common that the rider at the front will shoot across just as the lights change. If you’re at the back of that string, simply don’t risk running the light. If it means losing the group on that occasion, have a word next time you go out and ask the group to communicate and keep it safe, for everybody. Problem: People drop-kicking their back wheel when they stand out of the saddle. Solution: Watch the person in front get out of the saddle when they’re starting to go uphill and it’s often the case that their bike will kick back slightly. If you’re right on someone’s wheel and they move back suddenly it can be quite disconcerting. By practising hitting a steep incline and focusing all your movement forward smoothly, you can completely eliminate this happening. If it is someone else doing it to you, politely mention it or keep your distance! Problem: Not respecting the dynamics of the group. For example, attacking hard when it is meant to be a steady ride. Solution: If it is a hard ride you are after, it is a good idea to state that from the outset. Telling everyone you are going steady then ripping the gang’s legs off may assist your self-esteem, but it won’t do any favours for your popularity in the group! Problem: Strava champions who attack from the back, only to resume their rearward status once the segment is over! Solution: If you are a stronger rider it is only fair to do your pull on the front. Even if you aren’t one of the stronger riders in the group, showing willing by taking a short turn on the front will count far more in your favour than always hanging around at the back. In a race scenario, you may want to ride smart to conserve some energy for the final sprint, but on a training ride it should be about the fitness benefits and so don’t miss your turn! Problem: That there’s always at least one rider who thinks they’re riding on closed roads. Solution: When a rider has been doing a lot of closed-circuit racing or watching more riding than they’ve been doing, bad habits can creep into club rides, and it is everybody’s responsibility to keep things in order. Descending on the wrong side of the road, for example, is lethal but not unheard of when riders are looking to move up the group. Make sure that isn’t you and that you’re tucked in, even if others are fanning across the road. Problem: Overlapping of wheels instead of riding on the wheel in front. Solution: Giving yourself an escape route is a good idea, i.e. being aware of what is up ahead and having a bit of running space on the outside of the wheel in front if the person in front has to stop for any reason. Look after your own front wheel; if the rider in front moves can you avoid them? What’s more, if they start to echelon across the road, you could find your front wheel quickly taken out. Problem: Everyone yelling out obstacles instead of quietly pointing. Yelling rattles nerves. Solution: We’ve been on some club runs when the amount of screaming and shouting would suggest mass disaster, when in fact the group has simply passed a drain cover. 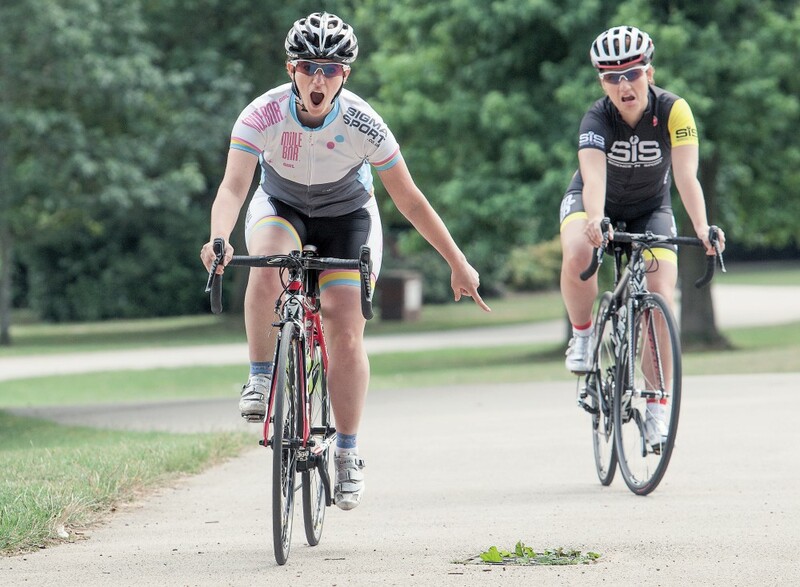 While pointing out slippery drains and big potholes is necessary to help the riders behind, erratically yelling is not. A nervous rider may panic at excessive shouting, and is more likely to cause a pile-up than the offending hole.